Driving to Freeman from Sioux Falls on my first day at the Freeman clinic made me feel anxious. Luckily, I was early enough to sit in my car to collect my thoughts for a few moments. I met my REHPS partner in the parking lot. I felt a lot better when I knew where the coffee was in the clinic. We met with the CEO who gave us a tour of the building, which included the hospital, clinic, and nursing home. He also explained upcoming remodel plans. He dropped us off to meet with several department directors. I was impressed with the amount of education, experience, and lady power in the room. A brief new employee orientation PowerPoint was discussed, along with pizza and salad from a local pizzeria. The pizza was good, but the salad was impressive; it must’ve been the curry in the salad dressing. Ruth Strasser (my housing provider) gave a short tour of Freeman, but due to the rain, it was cut short. A choir concert at Freeman academy showed me how important religion/spirituality is to the community. I am excited for our upcoming tour of the Mennonite and Hoodarite communities, and their culture. In the evening, I attended a grief group committee. There is a clear need for this kind of group to exist in the community. It was comforting to see people from different backgrounds give their perspective on certain topics. Today was surprisingly exhausting. Ruth and her husband are extremely accommodating, and I feel very lucky to be living in their home. I even had a hot meal for dinner. I watched some QVC before falling asleep before 11, which was super early for me! We began our day by sitting in on a HOSA (Health Occupation Students of America) meeting, which is a program designed to be like an outlet for high schoolers who are interested in careers in healthcare. Hospital staff were super interested in supporting this program, and believe they could provide a supporting, educational environment. Terri Behl, a physician assistant in the Menno clinic, allowed us to shadow her in the clinic and at the nursing home in Menno. It is clear she is a vital provider in the community, and is trusted among nursing home staff and residents. A few things Terri identifies as positives when working in a rural community is the autonomy, and witnessing patients progress throughout the lifespan. Jim Dobbs, a hearing aid specialist, provided us an opportunity to observe hearing aid fittings, cleanings, and follow up visits. He was able to provide batteries, and hearing aid wax filters for his clients. It was surprising to hear how expensive hearing aids are (between $4000 and $7000+), and Medicare and Medicaid do not cover this expense. However, new insurances are now starting to cover some or all of the cost. Since the Freeman clinic is considered a “critical access hospital,” their imaging equipment is up-to-date. Although the equipment is spread across the hospital, they are able to perform x-rays, CT scans, mammograms, and ultrasounds. Freeman’s therapy is outpatient and inpatient physical, occupational, and speech therapy. Since my first round of graduate applications was for occupational therapy, I was curious to spend time in the therapy unit. Tony Miller, an on-site physical therapist, provided us with details about their clientele range, and the upcoming remodel that will provide more privacy for patients. Tony has commuted from Sioux Falls for over 15 years. He enjoys the autonomy and flexibility in his schedule as it allows him to still play an active role as a parent to his children. Dr. Reis and his wife Shirley, and Ashley came over for dinner. Dale and Ruth provided a delicious homemade hot meal, which was a perfect end to a busy day. Ashley and I met with the nurses at the nurse’s station. Unfortunately, the provider we were supposed to shadow did not have enough surgeries scheduled for Friday, and rescheduled his appointments. Dr. Kirton allowed us to shadow him in the clinic, hospital, and nursing home for the rest of the day. I feel lucky to have CNA training and work experience in my early 20s because at times I knew what was being discussed. I had the privilege of watching a CT with contrast take place, and to process the image with my partner. The results of the scan were then sent to larger clinic for an interpretation. I concluded that most images that are taken in Freeman are sent to a larger facility for interpretation/diagnosis, and then a course of action is discussed. Throughout the day, I noticed Dr. Kirton was able to empathize, validate, and thoroughly explain medical proceedings with his patients and/or their families. It is clear his opinion and presence is highly valued in the clinic community. The most interesting part of my day was witnessing a left knee cortisol shot in an elderly patient. As a future social worker, I do not think I would have access to witness the medical side of patient care, so I am trying to learn and process as much as I can. Ruth drove Ashley and I to the clinic in Marion, which is has a similar setting as the Menno clinic. Watching a newborn get shots was difficult to watch, but I believe immunizations are necessary to prevent infections and diseases. The CNP we shadowed for the morning gave us an explanation as to why some parents choose not to immunize their children. After lunch, we sat in on a severe weather table top discussion. Representatives from their departments as well as those from Freeman EMT and fire also participated in the discussion. What was primarily discussed was the difference between a severe weather warning/watch, and tornado warning/watch. Each department described what their role was, and their procedures. The emergency alert system in Freeman has two whistles to notify the community of a warning/watch. Some group members expressed concerns about differentiating the difference between the whistle since one whistle rotates. In the end, communication between parties is critical to keeping residents of Freeman, and the staff and patients of Freeman hospital safe. The Bridgewater clinic was a little hard to find because Google Maps gave two locations: one in Bridgewater, and one in Dolton. Luckily, both Ashley and I ended up in the city of Bridgewater at the same time. The clinic was larger than the other clinics we have visited, and they had large exam rooms. Dr. Shakil Hafiz provided us with a detailed explanation of the sepsis continuum after the Bridgewater nursing home called him with a concern about a resident having a 102 fever. I was surprised to learn how time sensitive the medical intervention is for SIRS/sepsis so it does not to septic shock. We had the privilege of observing a patient with vascular dementia. Frist hand I was able to see how lack of blood flow to the brain affects memory, which in turn affects every day functioning. The patients spouse, also the caretaker, demonstrated extreme compassion, understanding and empathy towards the spouse when confused about what Dr. Hafiz would say. The spouse was able to take on the role of ‘go between’ for Dr. Hafiz and the patient so treatment could be more effective. As an upcoming doctor in Freeman and the surrounding area, Dr. Hafiz, who is originally from Chicago, strives to be open and approachable to all his patients, and staff. I admire this about him as I have encountered unapproachable doctors working as a CNA four years ago in rural Minnesota. I expected “more excitement” to happen in Chicago, however, I was wrong. Dr. Hafiz explained he wears “multiple hats” to accommodate each situation. After lunch, Ashley and I spent the afternoon at the Salem Mennonite Home. Shirley, the Director of Nursing (DON), and Jennifer, the assistant DON gave us a tour, as well as introduced us to several clients living in the facility. After discussing the possibility of transitioning to an independent apartment with a client, I was able to provide some of my concerns with the transition and the client’s level of functioning. I really enjoyed being there, and seeing each of the residents being treated with dignity and compassionate care. Ruth and Dale continue to be an excellent foster family for me! I had steak, salad, sweet potatoes (my new favorite! ), peas, and red wine for dinner. I cannot remember the last time I had a delicious meal, since I usually eat sandwiches, frozen pizza, and ramen. I feel very lucky to be placed with them. Spending the morning with Amanda and Lindsey really solidified my decision to pursue an MSW. I felt like they were just like me. Amanda showed me the type of assessments they use to determine cognitive function, as well as mental status. We observed several Client Care Meetings, which is similar to “staffings” I participated in at a previous job. Towards lunch time, Ashley grabbed me for an ER visit that required the patient to be airlifted to Sanford in Sioux Falls where a pediatric urologist was onsite. The ER had a camera and monitor connected to staff at Sanford so they could continue the appropriate treatment steps there. So far, I see the technology at the Freeman clinic to be up-to-date considering their status as a critical access hospital. We had lunch at Subway with Cheri Buffington and her daughter. Then Ruth took us to the dental clinic, two pharmacies, a flower shop, Dale’s Law office, and a historic building that has been restored into a boutique. At the boutique, they had the original safe (complete with keys, and safe deposit boxes), photos and other memorabilia that was found in the building. I loved looking at the photos, walking on the original hardwood floors, and learning about downtown Freeman history. The city of Freeman definitely has a lot to offer, and the community takes pride in living there and keeping their history alive. We started our day in social services where we observed a PHQ-9 assessment with Lindsey. Afterwards we discussed differences we observed, and where the resident ranked on the assessment. Amanda and Lindsey agreed that at the end of assessments, closed ended questions, such as “would you like some water?” rather than open ended questions, “is there anything I can do you for you?”, are better to conclude an assessment. We met with a hospital patient’s adult child to discuss future plans for the patient. Afterwards, a nursing home stay would probably be the best decision. Amanda then showed us that looking at a Medicare policy number can tell hospital staff a lot about a patient such as their marital status, and if they have worked or not. After lunch we observed another PHQ-9, and BIMS assessment. Then we attended a behavior documentation meeting for the nursing home residents. The Director of Nursing, Assistant Director of Nursing, CEO, Amanda, Lindsey, and Donna (Quality Improvement) were in attendance. Paper and electronic documentation was discussed as well as the Charge Nurses’ and CNA roles in documenting behaviors. Here, I observed some barriers that are needed to be discussed further to implement consistency. I appreciated being able to sit in on a somewhat tense meeting, as it helps me recognize that every facility, small or large, has areas that need work. Right before we were about to leave for the day, the nurses reported an incoming stroke/seizure patient. I observed the process of stabilizing the patient, which took longer than expected. When the patient stated seizing for the third time, I immediately began watching the clock, which I thought the others would do. When Dr. Hafiz asked how long the patient’s been seizing, I was able to provide that information: 45 seconds. I even impressed the nursing staff, which was cool. Before being airlifted, the patient needed to be intubated. That was the only time I had to leave the room for a few seconds. Luckily, no one noticed or asked questions. Because the nurses could not start an IV, an interosseous procedure was utilized. I guess that is procedure is fairly painful, but necessary. I ended my day with eating a delicious chicken meal with Ruth and Dale. Dale talked about some of his interesting stories as a lawyer. One of them included helping a transgender man obtaining guardianship over his aunt. I was surprised to learn the judge did not care if Dale’s client was transgender considering this was 25 years ago. Today was our second day in social services this week. I’ve noticed Amanda takes on a more administrative role in the hospital/clinic/nursing home, while Lindsey does more assessments, and has a case management role in the nursing home. Both positions are necessary for FRHS to function smoothly. A brief discussion on the three hospital patients took place this morning. The DON, Hospital Care Coordinator, PT, and Amanda were present. At noon, we observed an in-home hospice visit at one of the Village Homes in Freeman. The patient’s left forearm was measured for the nurse to see if the patient had lost weight, as well as checking for feelings of depression. Concerns of toileting and transportation were discussed as well. Overall, I thought the patient seemed to be in good spirits considering the reality of the situation. The hospital dietician provided us insight on the diet that is provided at the hospital. Something I have noticed while working in a nursing home setting is the diet is high in calories. The dietician explained the appetite of an aging person typically declines, or they have unhealthy snacks throughout the day. I was surprised to learn new nursing home clients gain 15 pounds as they adjust to living at the facility. Next, we attended a Quality Assurance Performance Improvement (QAPI) meeting for the nursing home. Client fall reviews, admissions, discharges, as well as mood/behavior charting was discussed. It is important for nursing staff to monitor negative behaviors because the social worker can then communicate to families if/when/how their family member is declining. Tomorrow we have our Hutterite Colony tour, which I am excited for! Today started off early: 7:30am to be exact. The clinic meeting employees and providers discussed the importance of annual wellness visits. An educational PowerPoint concluded the meeting. The breakfast provided was delicious- Greek yogurt, berries, and granola is the way to go. The ER has provided me several opportunities to observe different kinds of emergencies in Freeman. Before lunch, a young Hutterite child had a deep cut on the right wrist. When Dr. Hafiz asked the patient to describe how the cut happened, the patient was not compliant and talked through her mother in German or Hooderish. From a social worker’s perspective, I wanted to know what was behind the behavior that was deemed noncompliant. As Dr. Hafiz and Ashley assessed the depth of the cut, it was neat to see the interworkings of the joint underneath the skin – this is not a perspective I do not think I would even encounter post grad. After lunch, we had the privilege of having a colony tour at Wolf Creek, which was built in a valley surrounded by hills. I was excited for the tour as I would be able to strengthen my cultural competence, and increase my awareness of Hutterite communities in rural South Dakota. Norm, our tour guide, gave us some history of Wolf Creek – they are the second oldest colony in America. Those who established the colony emigrated from Germany, as well as their values: Faith and family. Our other tour guide from the colony, Brenda (25 years old), showed us several buildings and their community garden. Brenda showed us where food is prepared and eaten, as well as their church, school building, and laundry facility. Children eat separately from adults, also men and women eat at separate tables. It was surprising to learn that there are three languages children are taught: High German (spoken in church services), Hooderish (spoken within the colony or among others in community), and English (spoken to those outside of colony). The community nurse asked why colony members don’t speak English to each other when outside of the colony. Brenda said that their English skills are not as strong as their German/Hoodersish skills. She also indicated Hutterite people may have a fear of being judged for their ‘broken’ English, which may have contributed to the young paitent not being compliant in the ER. I asked Brenda what some of her favorite childhood memories were growing up in the colony- she stated she was more of a ‘tomboy’ and enjoyed playing in the creek and running across the grassy hills. Although Brenda has dreamt about living on her own, she enjoys the support she receives from her family and God. Overall, the Wolf Creek Colony tour has been a highlight for me since being in Freeman. Terri has been Ashley’s preceptor for this rotation so we have been tagging along with her quite a bit. The clinic rooms are small so when there are three people in a room plus a patient, the room gets even smaller. While irrigating a patient’s ears, Terri pulled out a large piece of ear wax. I was amazed how large it was! I’m sure the patient could hear much better after that. I also observed Terri complete a DOT physical, talk to a patient about pneumonia vaccines, and do a pre-op for a hip replacement. A team meeting with social services began my fourth and final week. It was emphasized that nursing home staff must recognize and honor patient/family choice. One thing I noticed while being in Freeman is the plethora of care for aging individuals – they have independent apartments, assisted living, and nursing home care, as well as hospice. As Amanda had stated during the meeting, social workers need to identify if the decision being made is good for the situation given or for the client. It is important to remember social workers need to advocate what is best for their client, and set firm boundaries – Amanda and Lindsey are very knowledgeable of their role in Freeman, as well as their limits. Ashley and I attended Meals on Wheels. We delivered hot meals and bread to six individuals around Freeman. A couple, who had moved to Freeman three years ago, drove us around town to drop off hot meals made by the nursing home. They were aware that the Meals on Wheels is a federally subsidized program that may not be around for long with our current administration making budget cuts. Gloria expressed concern that the clients of Meals on Wheels may have little social action to begin with and taking Meals on Wheels away will also take away that social interaction. After lunch, I accompanied Dr. Hafiz while he completed rounds in the nursing home and in the hospital. I enjoy following Dr. Hafiz because he challenges my thinking. Although I am not a med student, he takes the time to process symptoms, and the type of treatment he chooses. For example, I heard the term ‘lactic acid’ and immediately I thought about The Magic School Bus. Why? Because from that animated cartoon back in elementary school, I specifically remember visually learning about lactic acid building up in the muscles. From there, Dr. Hafiz was able to go further into detail as to why lactic acid builds up – the appropriate amount of oxygen is not reaching the muscle thus causing lactic acid to build up. We have a half day with Terri today. Our second patient was a diabetes checkup. The patient showed us their glucose monitor, Dario, that connects to an app on their iPhone. I had not heard of this meter or knew of this kind of technology to monitor blood sugars. I was surprised to see the app (available on android/apple products) created a chart, and graph to show fluctuations in blood sugars. Applying this new knowledge to my area of practice, I can be aware of this new technology as it may influence, or add convenience to those newly diagnosed with diabetes especially since technology is always developing. I have told Ashley several times it would be cool to witness a child birth, but they no longer do that here. Something that I was able to witness was a pap smear, which is named after a doctor who determined it was a useful way to detect signs of cervical cancer. I learned there are different speculums providers use depending on if a woman has had a vaginal birth. Ashley was able to do the entire pap smear by herself, and even made an effort to make show me a cervix, which I thought was very thoughtful of her. We had dinner at Dr. Dennis and Shirley Reis’ house. For the past four weeks, we have been told how delicious cheese pockets are. Everyone just seems to rave about this German food. Shirley’s cooking is just to die for – well not literally because then you could not enjoy it. In my eyes, she prepared a ten-course meal and then some: Homemade lemonade, salad, pickled cucumbers, a German biscuit I can’t remember the name of, and of course, cheese pockets with ham gravy. Dale, Ruth and I brought grapes and wine, and Ashley’s fiancé brought rhubarb crisp she made over the weekend. It was a feast!! And a memorable way to end our time in Freeman. I was stuffed, but we had good conversation afterwards, and felt I was able to be the naturally joking and sarcastic person I am. Ashley and I were able to reflect upon our experience in Freeman, as well as ask Dr. Reis for his opinion on situations. This morning I began in social services with Lindsey sitting in on care conferences. Ashley spent the morning with the cardiologist. Since my father died from a heart attack in his early 40s, it would have been cool to learn more about the heart or observe those affected by heart disease through a providers eyes. 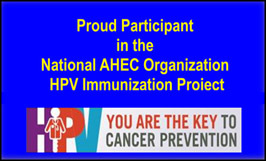 Ashley and I gave our presentation on HPV vaccines, and our experience in Freeman. Although nerve wrecking, the FRHS staff were appreciative and supportive! I could probably say for the both of us we have learned a lot, and for me, I have learned more about the medical side of things. Afterwards we sat with Amanda, Courtney, and Digna to discuss our schedules/activities planned, as well as feedback. Constructive criticism is something I value from professionals from all backgrounds. I see myself as always being able to improve in my role as a student, intern, or social worker. This rural health experience is something I would have never had the opportunity if Rebecca Donaldson had not come to our Foundation Master of Social Work class to speak on behalf of REHPS. After finding out I was chosen, she has made herself available for questions I had or continue to have. Overall, I am extremely appreciative of the accommodations that have been made for both Ashley and I. We feel as though our professional opinions were taken seriously and validated, which is a great feeling to have while still being in school. This experience has kicked off my summer to a great start! Today is bittersweet. I woke up to an empty house because my host family left for a short vacation the night before. Ashley and I started in cardiac rehab in the physical/occupational/speech therapy department. I learned a lot about what would qualify someone to be in cardiac rehab, and the type of clientele they have. We talked to two patients that described their heart complications: heart attack, bypass, stints… It made me reflect upon my late father’s heart attack – he died when he was 43 – and how he could have benefitted from this kind of program. At noon, we met with a writer for the Freeman Courier. It was great to reflect upon our time in Freeman. Of course we had all positive things to say! Then we had our picture taken in front of the hospital. It was fun to give our perspective on our overall experience, and to describe the REHPS program. I hope Freeman takes advantage of allowing REHPS students to come next year. Because I still had to attend class in person on Tuesday, I was glad to be placed close to Sioux Falls, and the staff at Freeman were able to accommodate that. Lastly, we visited the Freeman food shelf, which was situated in a church with a daycare. Considering Freeman is a small community, I was impressed with the quality of the food there: canned goods, soap, crackers, coffee, potatoes, frozen meat, and eggs just to name a few items there. They also provide turkeys during Thanksgiving, and coats in the winter. Although small, we were able to observe two families utilizing the food shelf. Volunteers kept track of people who visit the food shelf – people are only able to visit once a month – and walked them through the two rows to make sure they grabbed the limit of items they need. I really appreciated going here because it is something that I can apply to my practice. I would like to give special recognition to my host family, Ruth and Dale Strasser, and Ashley’s host family, Dr. Dennis and Shirley Reid, for housing us and cooking for us! I would also like to thank the Providers, Nursing, Social Services, and Administrative staff at FRHS for making our experience in Freeman memorable, and a great learning experience.